The partitioner continues getting more love and attention: now you can partition your RAID devices and we have started to work on supporting Bcache. A new YaST2 firewall UI is around the corner. The self-update feature has been extended to cover more cases. YaST supports now your brand new 4K display during installation. And, of course, some bugfixes (like proper handling of problems when trying to deactivate a DASD channel) and infrastructure improvements (check out our take on Travis caching). Our beloved Partitioner was one of the stars of the previous report, with news about several improvements and refinements. During this sprint it also received some love, not only with the addition of a couple of new features but also with more discussions and prototypes about the reorganization of the UI needed to bring even more improvements. One of those features introduced in the previous sprint was the ability to create a RAID based on whole disks with no partitions. Now we have closed the circle by allowing to manage partitions within a RAID. So now it’s possible to create RAID arrays based on any combination of disks and partitions and then either use those arrays directly to host a file system (or to act as LVM physical volume) or create partitions inside the array. Partitions that can be, of course, formatted, encrypted, used as LVM physical volumes, etc. With that, we can now say the Partitioner support every possible MD RAID setup. In the following animated screenshot you can see how the partitions of an MD RAID are listed in the left-hand tree of the Partitioner and in the table of devices of the RAID section, similar to how partitions of a hard disk are displayed. As you may have noticed, the main difference with other views is that, as already anticipated by the UI discussions summarized in our previous sprint report, the set of buttons adapts dynamically to the selected item on the table offering a different set of actions for MD arrays and for partitions. The interface showed in the previous screenshot, with its dynamic behavior, is just the first step in the direction already defined in the document that resulted from the previous sprint. Having that first fully functional prototype enabled us to rekindle the discussion about the best way to offer all the new possibilities of storage-ng in the Partitioner while keeping the user interface recognizable and familiar to the YaST users. After another round of discussions and several iterations of mock-ups, we ended up with the idea documented at this gist. That will be the guide for the UI changes we are already implementing as part of the next sprint as a way to unleash even more of the underlying power of storage-ng. But apart from revamping and improving the support for existing technologies with new possibilities, we also want the Partitioner to grow in scope, putting the new kernel technologies into the hands of our users. One of such technologies is Bcache. Bcache allows to improve the performance of any big but relative slow storage device (so-called “backing device” in Bcache terminology) by using a faster and smaller device (so-called caching device) to speed up read and write operations. The resulting Bcache device has then the size of the backing device and (almost) the effective speed of the caching one. As a first step to offer full Bcache support, the Partitioner can visualize all the Bcache devices and allows to manipulate its partitions. Broader support, like creating new Bcache devices, will follow in upcoming sprints. firewalld replaced the venerable SuSEfirewall2 as the default firewall solution in SUSE Linux Enterprise 15 and openSUSE Leap 15.0. And there is high chance that you have noticed that YaST does not offer a user interface to manage the firewall configuration anymore. Instead, it asks the user to use firewall-config, the official firewalld UI. But, fortunately, that’s about to change. During recent sprints we have been working in a new UI to manage firewalld configuration. It is still a work in progress, but it is capable of assigning interfaces to zones and opening services/ports for a given zone. We plan to release a first version as soon as we finish the integration with the AutoYaST user interface. So stay tunned! What is better than a high screen resolution? Simple: a higher screen resolution. 4k displays are arriving in the consumer mainstream, and 8k displays are the next big thing. But there are some real-world problems with that: with that large resolution, texts and graphics may become tiny – too tiny to read, too small to fill the available space on the screen. On your desktop, you can tweak those things – select larger fonts or larger icon sizes. But for the installer that’s another matter; it needs to autodetect the presence of such a display and then auto-scale the user interface so it is actually usable. We had a number of such issues in YaST; one was the font size, another the size of pixel graphics such as the time zone selection map. Those are now fixed. 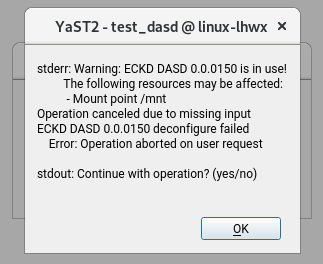 For backwards compatibility, the Qt library which we are using for the graphical UI of YaST does not do that completely automatically but we needed to explicitly enable a HiDPI mode. But now it does it all automagically for YaST. As you may know, YaST is able to update itself during system installation, which enables us to fix the installer by releasing updated packages even after the official release. However, sometimes we need to fix packages which are not part of the installer but they provide some additional data for it like installation defaults, system role definitions, etc. In order to support those scenarios, we have extended the installer to use the self-update repository as a regular (but temporary) one during the installation process. So with the next SUSE Linux Enterprise release we will be able to update that data too. Recently we discovered that YaST was getting frozen in s390 architecture when the user tried to deactivate a DASD channel in use. The problem was that dasd_configure, the underlying tool which takes care of deactivating the channel, was waiting for user confirmation. Definitely, losing user data is not an option so, from now on, the operation will be just canceled and YaST will report the problem, including all the details, so the user can solve the issue before trying to deactivate the channel again. For continuous integration at GitHub we use Travis which is easy to configure and use. Unfortunately, building there a big project like libstorage-ng takes a lot of time. In this case it is almost half an hour. Waiting so long to see the result after doing a small change in the code is quite annoying and unconvenient. And this is exactly the scenario where using the ccache tool helps a lot. ccache is a small wrapper around the standard C/C++ compiler which saves the compilation result for later. So if the same file is compiled later again then the cached result is returned immediately without calling the real compiler. Together with the Travis caching mechanism, which we use for storing and restoring the ccache files for each build, we reached a significant speed up. From 29 minutes to about 6 minutes, that is about four times faster! Of course, it highly depends how much the environment (compiler, libraries) or the source files have been changed since the last build. The bigger changes the more recompilation is needed, so in reality the speedup might be smaller. Check the related pull request if you are interested in the implementation details. The following sprint is already running and the team is working in really interesting stuff: finishing the bcache support, releasing a first version of the new firewall UI, proper support to use a whole disk as an LVM PV in AutoYaST, several improvements to the installer for CaaSP/Kubic, etc. Mostly me talking to myself, but the problem is real, and I think it should be fixed before 15.1 release… Sorry if that has got nothing to do with libstorage or yast. No. That issue is not in our radar. To be honest, I don’t believe any YaST developer scans regularly through the forum threads in order to detect real bugs to work on them (most threads are indeed questions, misconceptions or errors, rather than legitimate bugs).